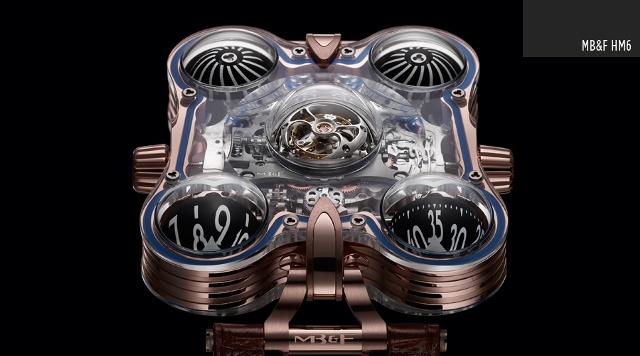 MB&F recently introduced yet another radical design with the HM6-SV, or Horological Machine N°6 Sapphire Vision. The avant-garde timepiece features a completely transparent case, placing the mechanical intricacies of the HM6 movement in full view. iW recently sat down with MB&F Head of Communication, Charris Yadigaroglou, to discuss the HM6-SV as well as other recent additions to the ranks of MB&F including the Sherman robot clock. Check out the interview below and read on for a technical understanding of these complex mechanisms. MB&F built the HM6-SV’s impressive nine domes and two sapphire plates utilizing the latest technological advances in machining. 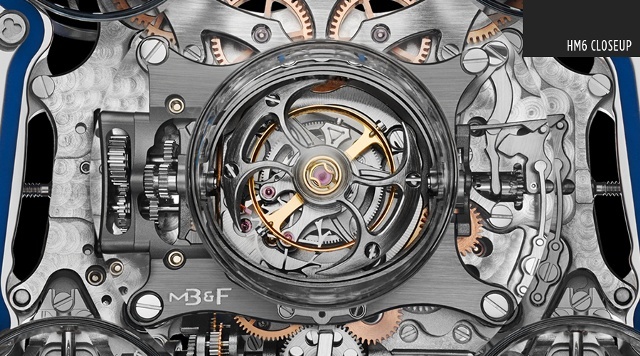 There are four domes on the underside of the HM6-SV and five on top, with an eye-like 60-second flying tourbillon protected by a semi-spherical titanium shield in the center. The surrounding domes encase twin spherical turbines, an hour indicator and a minute indicator. 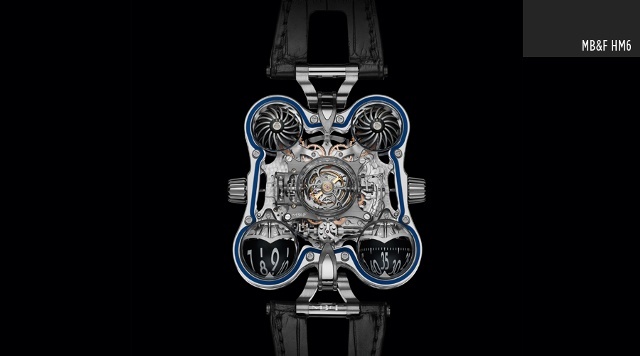 The sapphire elements of the case were created using diamond-tipped tools, followed by a tremendous amount of polishing. The time-consuming process of polishing was imperative in the creation of the HM6-SV, as it prevented discrepancies in thickness and visual distortion. The nine sapphire domes were formed employing a gluing process involving vacuum sealing in a high temperature oven, optimizing strength and water resistance. The complexity of the HM6-VS extends far beyond aesthetics. I always thought that the most beautiful part of HM6 was its movement, and that it was a shame not to show it, MB&F founder, Maximilian Büsser said. In typical MB&F fashion, the HM6-SV was designed, produced and assembled with a long list of mechanically-minded friends. Büsser teamed up with the Eric Giroud Design Studio and watchmaker, David Chandaux to execute his vision for the HM6-SV. The hour and minute spheres move perpendicular to the movement and are powered by an intricate drive train, managed by a crown on the right. This same crown is also used to wind the watch. On the left, the crown controls - like the wink of an eye - the spherical shield protecting the flying tourbillon. Completing the movement, an iridescent blue platinum battle-axe automatic winding rotor regulated by twin turbines. The HM6 movement itself is limited to just 100 pieces. So far 88 of the movements are accounted for including the 10 HM6-SV units. leaving us wondering what’s in store for the last 12 HM6 movements. 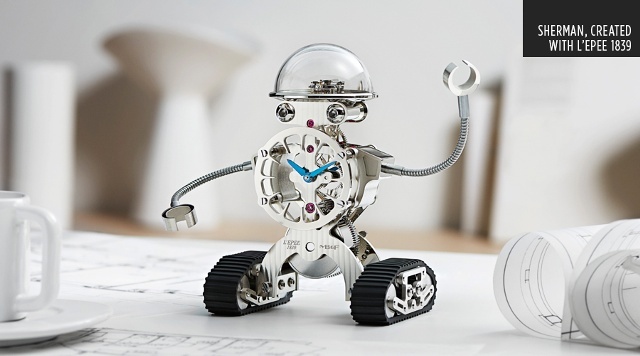 MB&F also released the Sherman, a robot-clock built to tell time and most of all, make people smile. This charming robot was designed in tandem with high-end clock maker, L’Epée 1839. Reminiscent of the Medium Tank M4, often called the M4 Sherman tank, used by the USA in WWII, Sherman can travel on his treads with a bit of a push. Some of Sherman’s mechanical elements were used for more than utility. For example. the inline eight-day movement provides power and represents his chest. In addition his brain is portrayed by the mechanism’s regulator, located under the blown mineral glass dome. Sherman is also quite the looker; he has all the excellent touches of haute horology including anglage, polishing, Geneva waves and satin-finishes. This creation continues MB&F’s latest initiative, A creative adult is a child who survived. Sherman represents Büsser’s desire to have a robot friend as a child and is the perfect side kick for those who like to dream. Sherman is available in limited editions of 200 in plated-palladium or gilded gold as well as 50 with diamond details. Oh, and have you meet his big brother, Melchior?